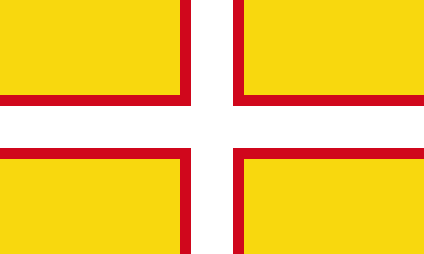 The flag was adopted in 2008 (when apparently, a lot of counties down south got into the flag business) and is know as St. Wite's Cross or The Dorset Cross. The red and white in the flag were taken from the Arms of Dorset, which features three red lions on a field of white. The gold in the flag is the interesting choice here for a variety of reasons: the supporters of the arms are two golden dragons. Wessex, the ancient Anglo-Saxon Kingdom which occupied much of present-day Dorset used a golden dragon as it's emblem. Dorset grows the unfortunately named rapeseed, which covers the county in fields of yellow- along with their wheat and barley. Bournemouth and Weymouth bring sandy beaches to the party. Golden Cap is the highest point on the Jurassic Coast (I'm pretty damn sure I've climbed up the cap and it's beautiful. Or whatever hill I climbed up was beautiful, anyways.) Gold Hill is a famous street in Shaftesbury. The Dorset militia and regiment used the color gold, red and green. Ah, Somerset... home of Glastonbury and drenched with Arthurian legends and mythology. If you ever go to Glastonbury and see the Tor, you could believe that in ancient times it really was the home of the Isle of Avalon- and there's a little bit of Grail Lore at play as well with the Glastonbury Thorn. It should come as no surprise that the flag of Somerset has connections to the old legends as well. The arms of Somerset feature a red wyvern holding a mace, supported by two deer. 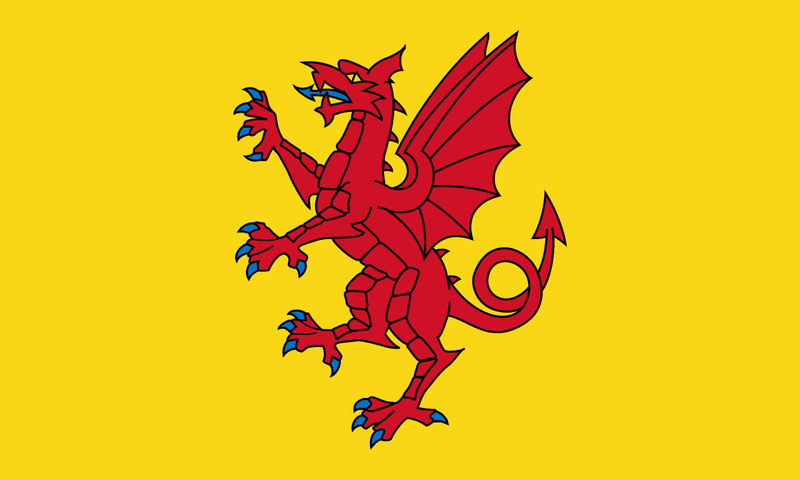 And the flag of the county takes the Red Wyvern and puts it on the field of gold without the mace. There's complicated heraldry at work here: the official arms aren't available for sale, so they couldn't bring the mace along for the ride, but it's also an important enough symbol for the county that if they slapped it on a flag without a mace, they'd be okay. The crest of the Red Wyvern was mentioned in the book "The Once and Future King" by TH White- Arthur wears it during the first joust between him and Lancelot. The flag was officially adopted in 2013. 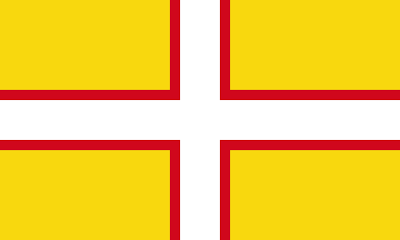 And there you have it: the flags of Dorset and Somerset! Remember, until next time keep your flags flying- FREAK or otherwise! *I miss the landscape of England. It's so green and beautiful and in my brain, for whatever reason almost instantly recognizable.